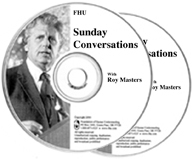 You will not soon forget what Roy Masters says here. This is language you will hear nowhere else; dealing with subjects you are all too familiar with. But, by “bringing in God,” the perspective completely changes when he talks about feelings, knowledge and illness. There are many quotable quotes in these two hours on such things as; guilt, pressure, emotions, addiction, political correctness, and the dangers of psychotics and sociopaths.